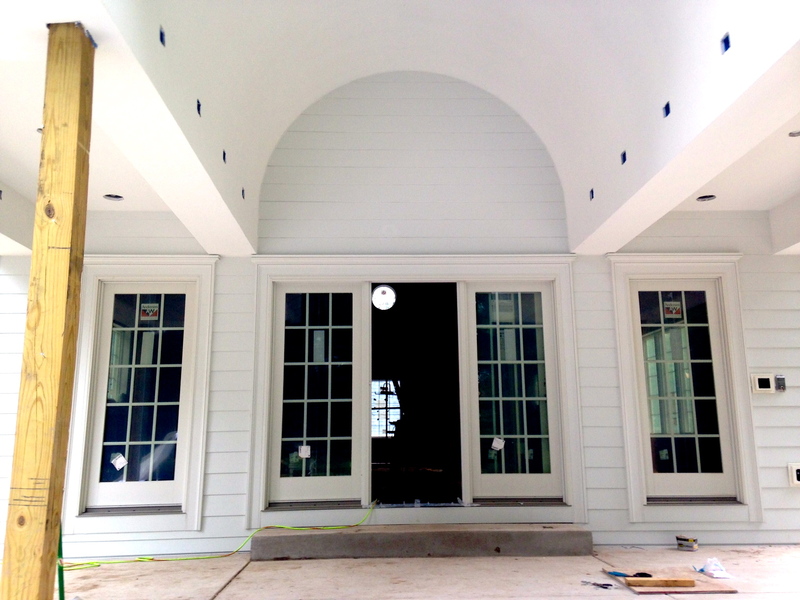 Siding – Carlson Exteriors Inc. This is it – The final portion to our four part series on comparing hard board siding. Quick re-cap, we did a quick overview on what hard board siding is and it’s general pros and cons. After that we zoned in on the specific brands LP Smartside and James Hardie Fiber Cement. Now we are going to look at Royal Celect Siding; what it is, it’s history, and the benefits and negatives! While Celect Siding is a new product to the industry, Royal Building Products has been one of the leading siding manufacturers for many years. Royal started off as a plastic company in the 70’s. They specialized in PVC products and window frames while maintaining a rather large PVC recycling facility. Very early on they developed a cellular PVC process that was the foundation to many off shoot companies Royal started. One of the products Royal has been popular for is their cellular PVC trim mouldings. These trim pieces have been nationally used for 30 plus years and still going strong. Celect is essentially the trim mould make-up but in a siding format. Celect siding has the addition of color options and a patented interlocking mechanism. Royal Celect Siding is made up of recyclable, cellular PVC material that is unaffected by moisture and the elements. It’s covered with a Kynar Aquatic coating which is stain and water resitant. Royal Celect siding has so many Pros. It’s completely maintenance free, looks like real cedar, extremely durable and gives your home stunning curb appeal. It’s made up of a cellular PVC material you don’t have to worry about recaulking, repainting, or any other annoying maintenance task. The cellular PVC has hardly any expansion during climate changes – this allows the seams to be incredibly tight and hard to see. The images below show that the siding seams are almost invisible from all angles. The surface coating is not lacking on the durability and maintenance free aspect. The Kynar Aquatic coating doesn’t fade, doesn’t chip easily, and will not need repainting. The proof is in the 25 year warranty against fading. Celect Siding is extremely durable against hail, golf balls, baseballs, bikes, etc. So if you live near a golf course or have kids this might be a big advantage to you. It’s wind resistance to winds up to 210mph. This siding is not going anywhere. You won’t have to worry about termites or any kind of mold growth. If the siding start to look dirty a simple wash with a garden hose will perk it up. Visually, the panels create a striking appearance. The panels come in four inch and seven inch reveals; so whether you desire the standard four inch reveal look or crave the trending wider reveal, Celect will have a panel for you. Royal also offers the Celect line in a shake profile and board and batten. The panels are made by a patented joint interlocking system. The interlocking of panels on all four sides prevents and buckling, warping, blown off panels, and shifting in panels. Celect siding is the only siding line that offers this unique joining system. The side profile shows off the interlocking lip on each panels. Pricing is both a pro and a con. If you are in the market for a hard board, Celect siding materials are around the same price range as other hard board materials. The labor pricing can fluctuate quite a bit depending on your contractor and how many windows you have (more on this in the Cons section). While Celect siding has not been around for a long time, the Royal brand comes with longevity, a great reputation, and a decent warranty on both the panel and the color coating. Click here to read the Celect warranty. The biggest negative comes from an install perspective. Celect siding is not installed the typical way so it requires a contractor to learn a new process. This isn’t necessarily bad, but many contractors don’t like taking the time to learn how to hang siding all over again. Since it’s a new product, not all contractors know how to install the panels so it may be difficult finding a contractor willing to quote your siding project. Typically, siding is installed corners and trim pieces first. This creates a framework for siding panels to fit inside. 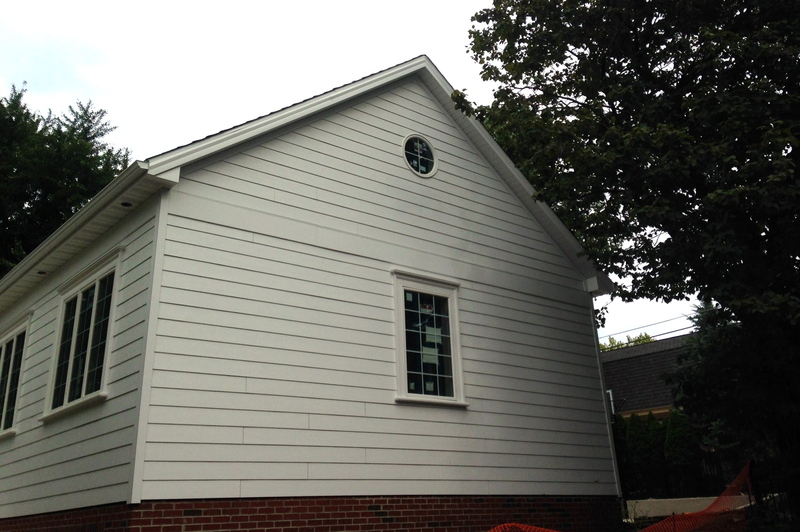 With Celect, you have to install siding panels first then use the corners and trim as finishing pieces. Siding panels are installed first. Corners, trim, and window casings are installed last. Royal Celect siding only offers 20 colors. This is enough to cover the basics; however, compared to LP and James Hardie you do not have endless choices or a custom color option. Along with being somewhat limited in colors, it is limited in panel options. Again, Royal Celect covers the basics with two siding widths, one shake style, and the board and batten option. 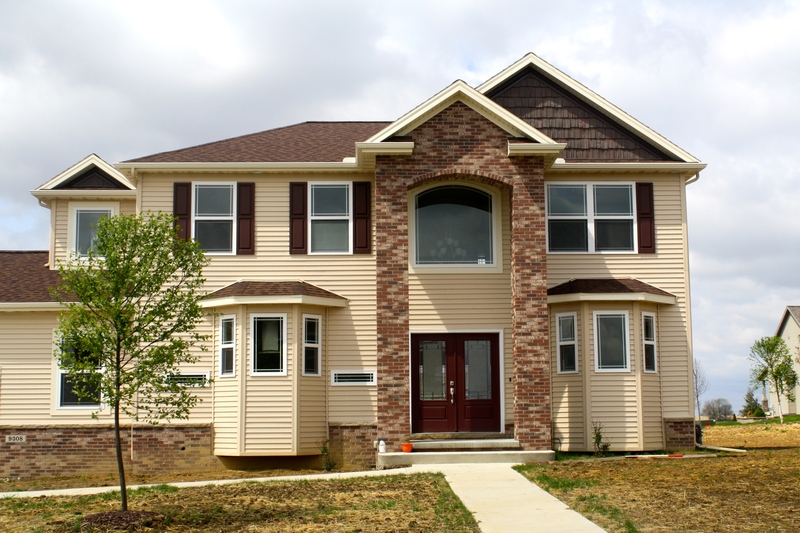 Both LP and James Hardie have multiple siding widths, a few shake styles, and different finish options. I assume Royal has limited the product lines since it’s a new product testing the waters of client demand. Their options may grow as the popularity of Celect increases. Even though pricing was listed as a pro it’s also a con. Contractors willing to install may not know what labor price is required with this product. You may wind up paying more than you should or you might luck out and get a bargain on labor if the contractor underestimates. The most tedious part of installing is the trim work around windows. If you have many windows or rather large windows, your pricing may be much higher than a home with less or smaller windows. Windows make the con list because they take up a majority of installer time and require exquisite craftsmanship. Each edge of a window is one piece. The four trim pieces of a window are joined together, like a frame, before installing on the wall around the window. If your window is a 3′ x 4′ you will need a trim work frame that fits a 3′ x 4′ window; if your window is 20′ x 7′ you will need a trim work frame that fits a 20′ x 7′ window. The larger trim frames become harder to hold and lift up to the window; it requires more man power holding in place as it’s secured. Since each side is a single piece, any larger sizes that may be accidentally cut too short add up to significant waste by an unexperienced installer. All hard boards are special order and are ordered specifically to the house. Usually special order siding materials cannot be returned, or if they can be returned come with a re-stocking fee. Contractors try not to order any waste with special order products. If materials are short ordered, it make take much longer to get any additional materials. Celect is no stranger to longer order times. Even thought Celect is newer product on the market, no homeowner should feel like they are taking a gamble by choosing this as your siding. If you don’t mind the options being limited to the basics, you will be thrilled with the durability, maintenance-free qualities to Celect siding. If you are just joining in; this is part three of a four part series on hardboards and knowing which one fits your needs. Part two covered LP Smartside in detail – Click here to read that article. Today we are covering James Hardie Fiber Cement Board’s history, make up, the pros and the cons. While James Hardie has a company history dating back 120 years they headed up fiber-cement products in the mid 1980’s. All of these products capitalized on fiber cement’s strength and durability. Over the years, James Hardie harnessed their technical and manufacturing process through research and experience in Australia. Many fiber cement siding companies have tried entering the market that James Hardie monopolizes, but all other companies were never able to compare to the quality, expertise, and research years of James Hardie. James Hardie Fiber Cement Siding previously only warrantied the panel and not the surface color as the color was applied by a third party. Customers got caught up in the “blame game” between the paint manufacturer and James Hardie. James Hardie empathized with their customer’s plight and decided to take over surface. They now “bake-on” the chosen color as the panel is manufactured. This creates a stronger integration between surface and panel. This also allows James Hardie to provide longer warranties for both surface color and panel failure. Fiber cement is made up of cellulose fibers, cement, sand, water, and minor additives. All of these ingredients combined, make a siding panel that will not catch on fire or burn, resists water damage, stands up against termites, and will not rot or warp (if installed properly). Where to begin on the huge list of advantages James Hardie Fiber Cement Siding? Fiber Cement siding may qualify for insurance discounts and gives an “upscale-look” to your home while being durable and low maintenance. 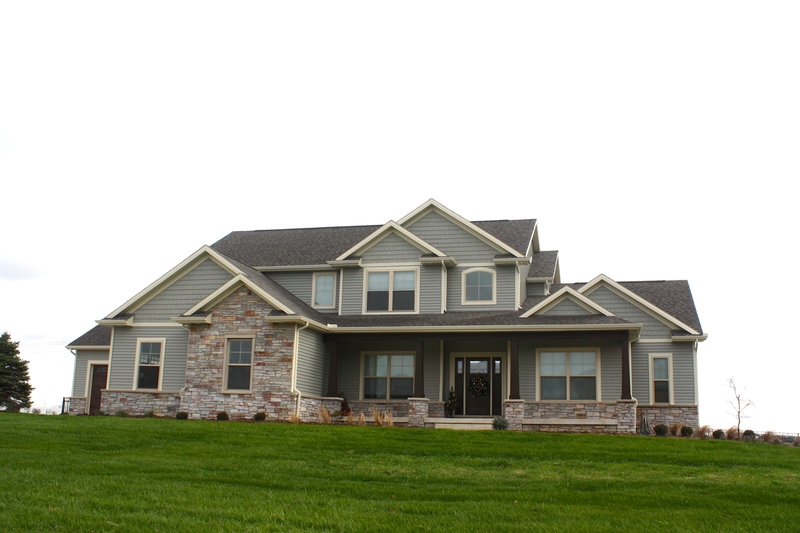 James Hardie Fiber Cement is resistant to fire and has high impact ratings. Depending on your insurance you may qualify for discounts; before selecting your home’s hardboard siding call your insurance and see what your numbers will look like if you had rated fire-restiant and rated impact-resistant siding. Some homeowners have saved as much as 20%! Click here to read more about James Hardie Fire Resistance. Appearance wise, you can tell fiber cement siding is not your average siding. It looks identical to cedar siding and has a wide range of lap panels, shake styles, and board and batten or sheet cladding available. Any style you have envisioned, James Hardie will have it. 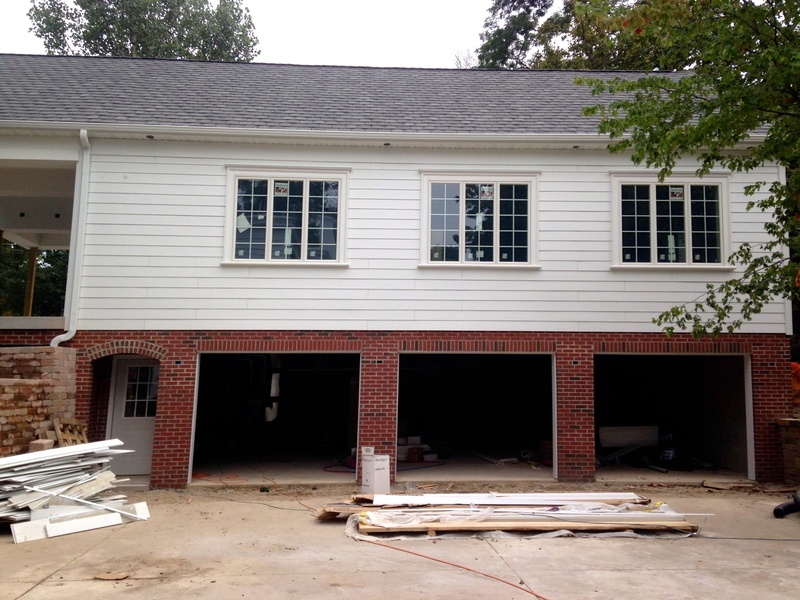 James Hardie boasts widths from 5 1/2″ – 12″! Since the surface color is integrated in the manufacturing process, you won’t have to worry about age showing on darker colors. James Hardie has patterned with Sherwin Williams to get you any color siding in Sherwin Williams paint selections. You have endless choices! Every James Hardie product comes with two warranties; 1- Color Finish Warranty for 15 years and 2- Fiber Cement Panel Warranty for 30 years. With Cedar siding you have to re-paint your siding every 5 years. If you are the DIY homeowner you can sink a ton of time into re-painting your home every 5 years. If you are not the DIY homeowner, you can spent a decent chunk of change on re-painting your home every 5 years. With James Hardie- you don’t have to worry about the paint chipping or needing repainted that frequently. If your fiber cement siding was installed incorrectly, your warranties will be voided and your siding could rot or warp as early as 5 years! Do your research on your potential contractor and make sure they know how to install. James Hardie is very specific in installation requirements. Click here to read the whole guide. The guide can be intimidating and will not be read by the faint of heart. Some installers do not like installing fiber cement siding because it requires special blades and is heavier than other hardboards on the market. This may make James Hardie Fiber Cement siding more expensive than other products- but this all depends on your contractor. It’s not a bad idea to call James Hardie directly and ask them what contractors in your area to they recommend. 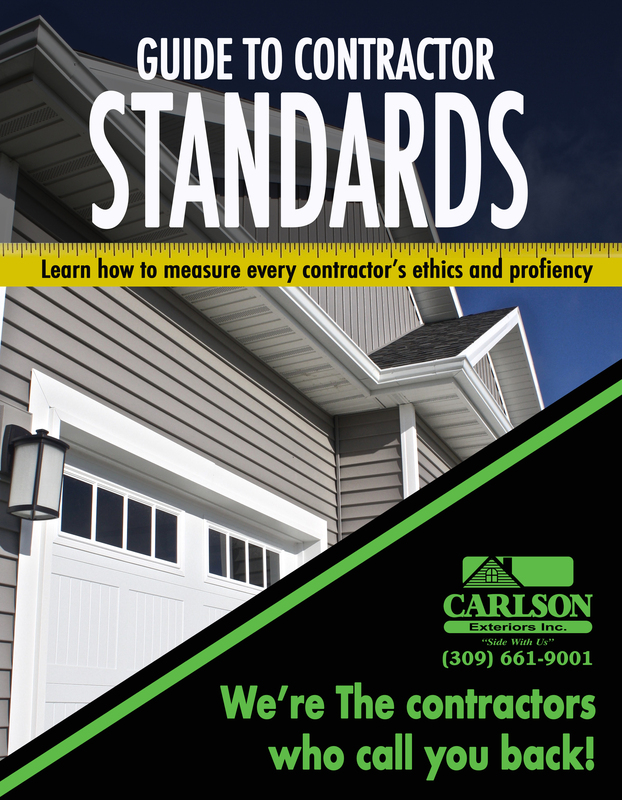 Fun Fact: If you live in Central, IL, Carlson Exteriors is the only James Hardie Preferred Contractor. A small piece of metal is placed behind siding joints. Again, the gapping can be an issue for some homeowners. This gap is required by James Hardie to allow your siding to minimally expand and contract over the seasons. Fiber cement is a wet manufacturing process- the initial gap is left with the intention of your siding to shrink. Behind each gap is a pan flashing the same color as your siding (just like LP). This pan flashing make the gap not as noticeable. Similar flashing is installed where siding butts up against roof lines. The pictures below show the gape between James Hardie siding and shakes. The gap is smaller where horizontal lap siding meets the roof line but it is still noticeable. This may bother some homeowners. The gap between James Hardie shake is more noticeable than with lap siding. James Hardie does everything in their control to make their fiber cement siding last, but all of that can be undone if the homeowner does not stay on top of caulking every 3-5 years. Windows, corners, and trim details will need re-done. 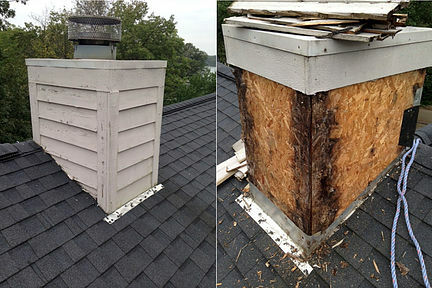 If you don’t perform this preventative maintenance, your siding can start to de-laminate, warp, or rot. If you are interested in a siding that can score you some insurance discounts- this is the product for you! This siding has a wide array of styles, sizes, colors, and accessories to fit your dream home that vinyl and other hardboards can’t offer you. Welcome back! Last post from this series we quickly covered 3 hard boards that are a hot topic: LP Smartside, James Hardie Fiber Cement, and Royal Celect siding. If you missed it and want to catch up- Click Here! Part 2 is all about LP Smartside: it’s history, material make-up, the pros, and the cons. LP (Louisiana Pacific) had a product in the late 90’s called Inner Seal that prematurely rotted causing de-lamination, color changes, and sometimes fungi growth. A large class-action lawsuit was brought on by homeowners, shareholders, and even an attorney general! LP worked as quickly as they could to pay out all losses and begin reformulating their failed product they still believed in. This massive public failure birthed LP Smartside. LP actually boasts about this lawsuit when questioned about potential moisture management issues for Smartside. Not only did they learn from their product mistakes, they stood behind it and made sure their customers were taken care of correctly and as fast as possible. Not every company is known for being fast to pay out warranties that are due. LP Smartside is made up of a mixture of binders, waxes, and zinc borate all throughout the wood strands and is finally bonded with a water-resistant, resin-saturated overlay. The wood used in Smartside products comes from a renewable forest; the binders and resins coating this wood make it high-impact proof. It can withstand golfballs, hail, rocks from lawn mower, balls, bikes, or nearly anything else that might hit it. The waxes and resins make the wood water resistant wile the Zinc borate helps protect against algae, fungi, insects, or any other pesky pests. There are so many wonderful benefits to LP Smartside ranging every degree from purely aesthetic reasons to endurance qualities. Like most hardboards, LP Smartside has a commanding appearance over vinyl siding. Smartside looks exactly like real cedar siding but a fraction of the real wood maintenance. Larger reveal siding is starting to re-surface in siding trends. If you are looking at vinyl products, wider reveals are scarce (if any!). LP Smartside offers widths up to 8″, 12″, and 16″ depending on style and you can choose between woodgrain or smooth surface. You also can go to Sherwin Williams and pick out any one of their paint colors and have LP match the color exactly! This siding has a very high impact rating. Many insurance companies offer a break when your siding (or shingles) reach a certain level of impact rating. Like you read in an earlier paragraph – durable siding will withstand hail, golf balls, balls, bikes, rocks from mowers, birds, or almost anything that hits it. Depending on your contractor, LP Smartside can either be equal to or less than the cost of Fiber Cement siding because it’s slightly easier to work with. It’s easier to work with because you don’t need special blades to cut or work with it, lighter weight, and it doesn’t produce silica dust. Like most specialty products, the warranties are preserved by your original installers and preventative maintenance. If your contractor doesn’t know the ins and outs of proper install for LP Smartside, your warranty will be voided or worse- your beautiful siding could fail! Every hardboard siding requires some amount of gapping to allow for expansion and contraction. This fluctuation happens as the siding starts to acclimate to current weather conditions and as it endures the 4 seasons. Since LP is a dry manufacturing process, the initial gap is left with the intention for the siding to swell slightly. 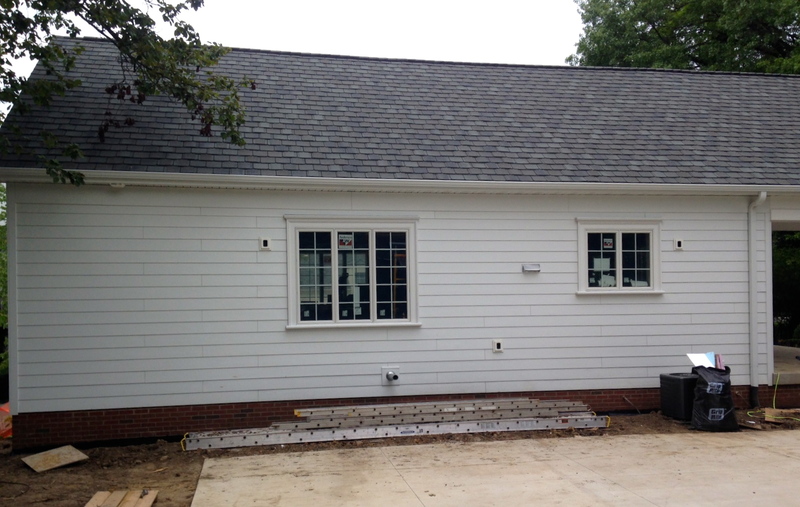 Behind each gap, a pan flashing detail, the same color as your siding, will be installed to disguise the gap. Visually speaking, some homeowners do not like the look of the gap. There also needs to be a 1″ clearance on all roof lines and a 6″ ground clearance. This spacing is reserved for expansion and contraction. The gapping along roof lines is covered with a metal detail that some homeowners find distracting. While the warranty for LP is phenomenal (Click here to read it), if you don’t stay on top of caulking maintenance you will void the warranty. Areas that need to be re-caulked roughly every 3-5 years are around windows, corners, and any trim details. Most installers familiar with LP Smartside will do a “healthy” amount of caulking when they install – They know it might be an easy, but detrimental, thing to slip the homeowner’s mind. If you are looking for siding product this actually made out of wood – LP Smartside is the product for you! It looks just like cedar siding, comes in many wider reveals, impact resistant, requires minimal maintenance compared to real wood siding. As you can see, vinyl is thin shell creating the allusion of a solid strip of siding while the 3 hard boards shown (LP, James Hardie, and Celect) are actual solid siding panels. LP Smartside is made up of wood fibers combined with waxes, industrial grade binders, Zinc-borate, and resin overlay. 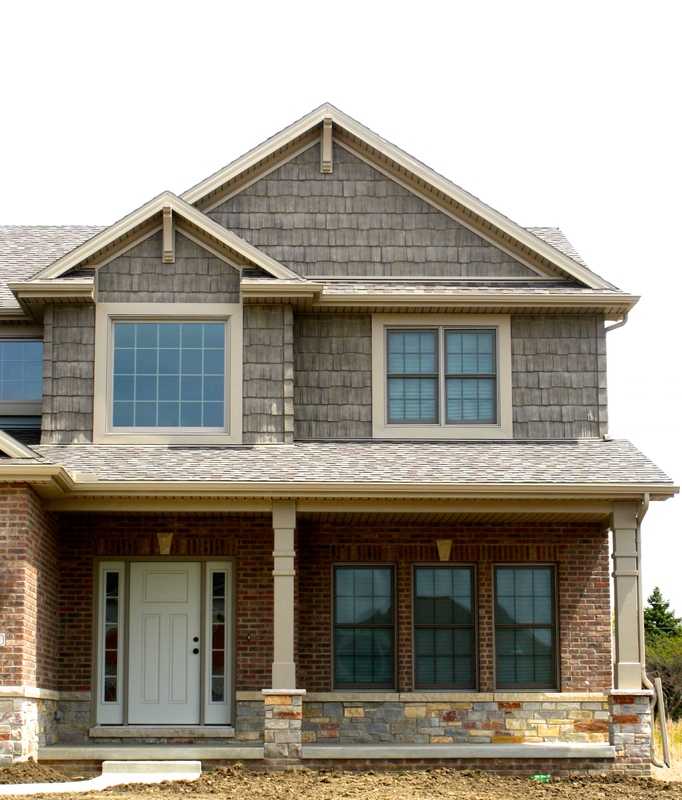 James Hardie has perfected the fiber cement industry with their line of fiber cement siding. Royal Celect is a cellular PVC siding very similar to Royal’s trim that they have been providing the construction industry for years. Impact resistance, gives off a more truer wooden siding or shake appearance (aka greater curb appeal, wider range in color options, and wider range in siding reveal size are just a handful of advantages provided by Hardboard siding. Over the next couple of months, we will be focusing in on the pros and cons on each individual brand. Hopefully these articles will help you decide if hardboard is right for you and narrow down your options if it is. Stay tuned for the next blog, which will be all about LP Smartside! 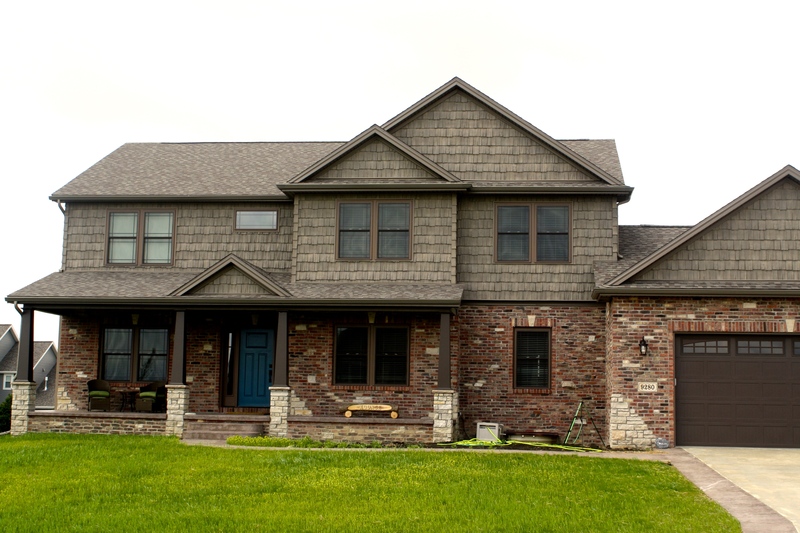 Here is a quick teaser-image of an LP Smartside job Carlson Exteriors installed in Savoy, IL. 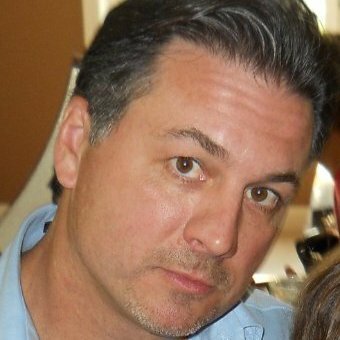 This past week, I was able to connect with Exteria Building Products’ Sr. VP of Sales, Frank McCormack. 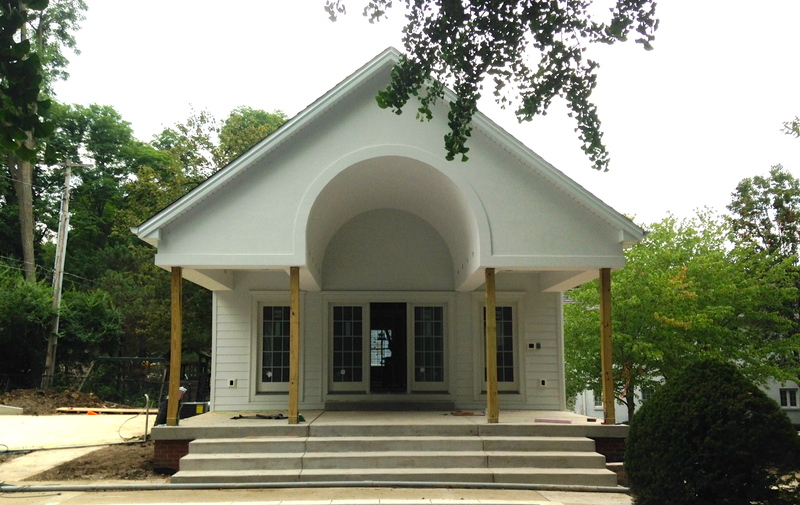 Exteria is the manufacturer for Carlson Exterior’s preferred vinyl shake products. We’ve chosen Exteria’s shakes for the products ability to look like natural wood shakes without the maintenance or cost of wood; this makes Exteria’s shake the perfect and affordable option to homeowners that want the look of wood shakes without all the negative attributes. “Exteria Building Products is one of the leading Manufactures of exterior cedar and masonry polypropylene siding materials in North America. Exteria entered the exterior cladding market in 2009 with the acquisition of the pioneer of polypropylene siding material, Nailite International. Since the acquisition, Exteria has made a commitment to continue the tradition of producing and introducing products that focus on realism, authentically replicating their natural counterparts. One of the key differentiators between Exteria and many of its competitors is a proprietary coating process that lends itself perfectly to the aforementioned commitment to realism. If you are interested in seeing or know more about Exteria Building Products shakes, please visit Exteria’s website. If you’d like us to give you a quote on installing their products on your home, please contact us through our website.